The President's FY 2012 request for NASA includes $5,016.8 million for Science. NASA continues to expand humanity's understanding of our Earth, our Sun, the solar system, and the universe with 56 science missions in operation and 28 more in various stages of development. The Science budget funds these missions as well as the research of over 3,000 scientists, engineers, technologists, and their students across the Nation. NASA is guided in setting its priorities for strategic science missions by the recommendations of the NRC decadal surveys. The Agency selects competed missions and research proposals based on open competition and peer review. NASA's science efforts continue to advance a robust and scientifically productive program while making difficult choices commensurate with the Government-wide priority to constrain the Federal budget. The FY 2012 budget request includes $1,797.4 million for Earth Science. NASA's constellation of Earth observing satellites provides much of the global environmental observations used for climate research in the United States and abroad. In early FY 2012, NASA plans to launch the National Polar-orbiting Operational Environmental Satellite System (NPOESS) Preparatory Project (NPP), continuing selected climate data records and becoming an integral part of the Nation's operational meteorological satellite system for weather prediction. We also plan to select new Venture Class science instruments and small missions in FY 2012. The Aquarius instrument on the Argentine Satelite de Aplicaciones Cientificas (SAC)-D mission (launching later this year) will deliver the first global ocean salinity measurements to the science community in FY 2012. The Orbiting Carbon Observatory 2 (OCO-2), Landsat Data Continuity Mission (LDCM), and the Global Precipitation Measurement (GPM) missions will be in integration and testing in FY 2012. The first two NRC Decadal Survey missions, Soil Moisture Active/Passive (SMAP) and the Ice, Cloud, and land Elevation Satellite-2 (ICESat-2), will both enter into development during FY 2012. This budget request also funds robust Research and Analysis, Applied Science, and Technology programs. In this climate of fiscal austerity there are some important capabilities that will not be developed in order to keep others on track in more constrained future years. Development of the second two Tier 1 Decadal Survey missions, the Deformation, Ecosystem Structure, and Dynamics of Ice (DESDynI), and the Climate Absolute Radiance and Refractivity Observatory (CLARREO), has been deferred resulting in launch dates no earlier than 2020. NASA will continue pre-formulation work on the DESDynI and review international partner options. However, the FY 2012 request enables the Gravity Recovery And Climate Experiment Follow-on (GRACE-FO), the Pre-Aerosols-Clouds-Ecosystems (PACE), and the Tier 2 missions Surface Water and Ocean Topography (SWOT), and Active Sensing of CO2 Emissions Over Nights, Days, and Seasons (ASCENDS) to go forward as planned. The Science budget request includes $1,540.7 million for Planetary Science in FY 2012. NASA and its partners consider the period from October 2010 to August 2012 (the length of a Martian year) to be the "Year of the Solar System." The Juno mission will launch in August 2011 and arrive at Jupiter in 2016. The Gravity Recovery And Interior Laboratory (GRAIL) mission, following launch in September 2011, will enter lunar orbit and help determine the structure of the lunar interior from crust to core; the mission will advance our understanding of the thermal evolution of the Moon by the end of its prime mission in FY 2012. A newly installed webcam is giving the public an opportunity to watch technicians assemble and test NASA's MSL "Curiosity," one of the most technologically advanced interplanetary missions ever designed. More than one million people have watched assembly and testing of Curiosity via a live webcam since it went on-line in October. Curiosity will launch in early FY 2012 and arrive at Mars in August 2012; it will be two times as large and three times as heavy as the Spirit and Opportunity rovers, and will focus on investigating whether conditions on Mars have been favorable for microbial life and for preserving clues in the rocks about possible past life. The MErcury Surface, Space ENvironment, GEochemistry and Ranging (MESSENGER) spacecraft will arrive at Mercury later this month and will complete its first year in Mercury orbit in March 2012. MESSENGER's instruments will map nearly the entire planet in color, image the surface in high resolution, and measure the composition of the surface, atmosphere and nature of the magnetic field and magnetosphere. During its nearly decade-long mission, the Dawn mission will study the asteroid Vesta and dwarf planet Ceres -- celestial bodies believed to have accreted early in the history of the solar system. Dawn will enter into orbit around Vesta this summer and will depart in 2012 for its encounter with Ceres in 2015. NASA and the European Space Agency (ESA) have selected the five science instruments for the 2016 ExoMars Trace Gas Orbiter mission. The budget also supports robust Research and Analysis and Technology programs. NASA recently received the new National Academy of Sciences Decadal Survey for Planetary Science, entitled Vision and Voyages for Planetary Science in the Decade 2013--2022. We are grateful to the Academy and to all the Survey participants for their hard work and thoughtful recommendations . NASA will use this survey to prioritize ongoing programs and future mission opportunities. 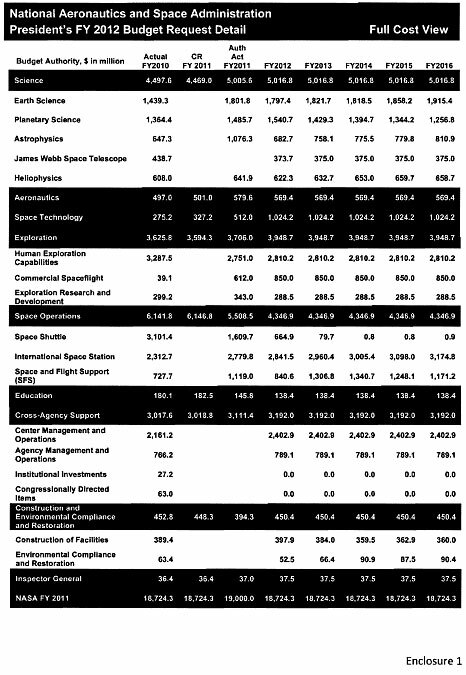 The FY 2012 budget request includes $682.7 million for Astrophysics (not including an additional $375 million for the James Webb Space Telescope [JWST] which is detailed below). This is a golden age of space-based Astrophysics, with 14 observatories in operation. Astrophysics research, technology investments, and missions aim to understand how the universe works, how galaxies, stars and planets originated and developed over cosmic time, and whether Earth-like planets and life exist elsewhere in the cosmos. The FY 2012 budget request reflects the scientific priorities of the new National Academy of Science Decadal Survey entitled, "New Worlds, New Horizons in Astronomy and Astrophysics." The budget includes additional funding for the Explorer mission selection planned for 2012, sustains a vigorous flight rate of future astrophysics Explorer missions and missions of opportunity, and increases investments in recommended research and technology initiatives. Funding is also provided for pre-formulation investments in recommended large missions beyond JWST, while work on the Space Interferometry Mission (SIM) and Joint Dark Energy Mission (JDEM) has been brought to a close, consistent with the recommended Decadal Survey program. SOFIA will complete its open door flight testing and conduct the first competed science observations in FY2012. The Nuclear Spectroscopic Telescope Array (NuSTAR) mission will launch in early 2012. The NASA Astrophysics budget also supports continuing operations of Hubble, Chandra, and several other astrophysics observatories in space. The budget increases funding for the core Astrophysics research program, including sounding rocket and balloon suborbital payloads, theory, and laboratory astrophysics. The FY 2012 budget request includes $375 million for the James Webb Space Telescope (JWST). JWST is now budgeted as a separate theme, reflecting changes implemented in FY 2011 to improve management oversight and control over this critical project, as recommended by the Independent Comprehensive Review Panel's (ICRP) report in November 2010. The project, previously managed within the Astrophysics Division, is now managed by a separate program office at NASA Headquarters. Management of this JWST organization at Headquarters now reports directly to the NASA Associate Administrator and the Associate Administrator for Science. The Goddard Space Flight Center has implemented analogous changes, with JWST project management now reporting directly to the Center Director. JWST was the top priority large mission recommended in the previous NRC Decadal Survey and is considered a foundational element of the science strategy in the new Decadal Survey for Astronomy and Astrophysics. During 2010, JWST completed its most significant mission milestone to date, the Mission Critical Design Review. Cost growth and schedule issues identified following this milestone led to the formation of the ICRP. The ICRP report concluded that the problems causing cost growth and schedule delays on the JWST project are associated with cost estimation and program management, not technical performance. The $375 million funding in 2012 gives the program a stable footing to continue progress while the agency develops a revised program plan that includes a realistic assessment of schedule and lifecycle cost. The revised schedule and lifecycle cost will be reflected in the 2013 Budget request. The FY 2012 budget request includes $622.3 million for Heliophysics. NASA's heliophysics satellites provide not only a steady stream of scientific data for NASA's research program, but also supply a significant fraction of critical space weather data used by other Government agencies for support of commercial and national security activities in space. Those agencies use the data to protect operating satellites, communications, aviation and navigation systems, as well as electrical power transmission grids. The spacecraft also provides images of the Sun with ten times greater resolution than high- definition television in a broad range of ultraviolet wavelengths. On February 6, 2011, the two STEREO spacecraft reached 180 degrees separation; when combined with SDO, these spacecraft will enable constant imaging of the full solar sphere for the next eight years, as the solar cycle peaks and begins to decline again. These three spacecraft working together and in combination with NASA's other solar observatories will give us unprecedented insight into the Sun and its dangerous solar storms that could threaten both satellites and humans in space as well as electric power systems on Earth. NASA has begun development of a mission, called Solar Probe Plus, that will visit and study the Sun from within its corona--a distance only 8.5 solar radii above its surface. The FY 2012 budget will enable completion of the Radiation Belt Storm Probes mission for launch in FY 2012 as well as the completion of development of the Interface Region Imaging Spectrograph (IRIS) Explorer mission. In FY 2012, the Magnetospheric Multiscale (MMS) mission will enter its assembly and integration phase, the Solar Orbiter Collaboration with ESA will undergo Mission Confirmation Review, and the Solar Probe Plus mission will enter into the preliminary design phase. NASA has increased funding for the next Explorer mission selection planned for 2012 to enable selection of up to two full missions, as well as instruments that may fly on non-Explorer spacecraft. The budget also supports robust Research and Analysis and Sounding Rocket operations programs. The National Academy of Sciences has begun work on the next Decadal Survey for Heliophysics and we anticipate its release in the spring of 2012. The FY 2012 budget request for Aeronautics is $569.4 million. As an industry, aviation contributes $1.3 trillion to the Nation's economy and employs over one million people. Airlines in the U.S. transport over one million people daily, but during peak travel times the air traffic and airport systems in the U.S. are stretched to capacity. Environmental concerns, such as aircraft noise and emissions, limit increased operations and the expansion of airports and runways. In response to these challenges, the Nation is pursuing the realization of the Next Generation Air Transportation System (NextGen). NextGen will accommodate more aircraft operating within the same airspace, including aircraft with widely varying performance characteristics. The President recently challenged the Nation to increase its competitiveness in advanced technologies. NASA meets this challenge with aeronautics research to create the safer, more fuel-efficient, quieter, and environmentally responsible aircraft and air traffic management procedures needed to make NextGen a reality. * The Aviation Safety Program conducts research to ensure that current and new aircraft and operational procedures maintain the high level of safety which the American public has come to count on, even as aviation systems become more complex. Last year, the Program published guidelines on automation, displays, and alerting technologies for future aircraft cockpit designs based on data collected from real flight crews during simulations of high-air-traffic-density operations. Further increases in air traffic will require even higher levels of automation without sacrificing safety. NASA is addressing this need by developing new methods to verify and validate complex aircraft and air traffic control systems and further developing human performance models to be applied in the design of automated systems. The Program is also developing data mining methods that will enable the discovery of safety issues through automated analysis of the vast amounts of data generated during flight operations. These methods will enable a new, proactive approach to aircraft maintenance and design to avoid the occurrence of safety issues, rather than a reactive approach after a safety-related incident occurs. * Reductions in environmental impact will be achieved not only through new aircraft, engines, and fuels, but also through improved air traffic management procedures. The Airspace Systems Program is developing these procedures in order to provide the flexibility needed to add capacity to the system as air travel demands increase. Last year, we partnered with the Federal Aviation Administration (FAA), Boeing, Sensis, United Airlines, and Continental Airlines to complete joint simulations of new Efficient Descent Advisor (EDA) procedures, and in FY 2012, the Program will deliver documentation of the results to the FAA. EDA procedures are a key component of the FAA's 3D-Path Arrival Management program and NextGen and can save hundreds of pounds of fuel and carbon dioxide emissions per participating flight, while reducing noise over surrounding communities. In FY 2012, we will also accelerate field trials of new procedures enabled by Automatic Dependent Surveillance-Broadcast (ADS-B) technology. This effort will demonstrate near-term and mid-term ADS-B application benefits and provide airlines with data to support their strategic decisions related to the significant investments they need to make to equip their aircraft with ADS-B capability. * The Fundamental Aeronautics Program seeks to continually improve technology that can be infused into today's state-of-the-art aircraft, while enabling game-changing new concepts, such as Hybrid Wing Body (HWB) airframes, tilt-rotor aircraft, low-boom supersonic aircraft, and sustained hypersonic flight. In FY 2012, the Program will accelerate research on a number of key enabling technologies identified through four conceptual design studies completed last year in collaboration with industry and academia. The Program will also expand the measurement of emissions generated when using non-petroleum alternative aircraft fuels. In FY 2012, we will develop instrumentation and operating procedures in preparation for a flight test campaign using the NASA DC-8 aircraft operating at relevant altitudes and cruise speeds. This will provide the first-ever data to improve our understanding of alternative fuel impact on contrail formation, an important factor in aviation climate impact. * The Integrated Systems Research Program evaluates and selects the most promising "environmentally friendly" engine and airframe concepts emerging from the fundamental research programs for further development, integration, and evaluation in relevant environments. Last year, we completed the last of 80 flights to explore the stability and control characteristics of the sub-scale X-48B HWB aircraft. In FY 2012, we will conduct the first-ever testing of an Hybrid Wing Body non-circular fuselage section fabricated using a new low-weight, damage- tolerant concept for composite aircraft structures. Beginning this year, the Program is also addressing the growing requirement to integrate unmanned aircraft systems (UAS) into the national airspace system. Current FAA regulations are built upon the condition of a pilot being on-board the aircraft. The Program will therefore generate data for FAA use in rule-making through development, testing, and evaluation of UAS technologies in operationally relevant scenarios. U.S. leadership in aerospace depends on ready access to technologically-advanced, efficient, and affordable aeronautics test capabilities. NASA's Aeronautics Test Program makes strategic investments to ensure the availability of these ground test facilities and flight test assets to researchers in Government, industry, and academia. In addition to this strategic management activity, the Program will continue with the development of new test instrumentation and test technologies. The Program is modifying a Gulfstream III business jet in order to flight test a new approach to reducing drag on an aircraft by adding carefully engineered surface roughness to the wings. This new flight-test capability will enable us to test this drag reduction concept for the first time at the altitudes and speeds at which commercial aircraft typically cruise. NASA cannot do all of these good things alone. Our partnerships with industry, academia, and other Federal agencies are critical to our ability to expand the boundaries of aeronautical knowledge for the benefit of the Nation. These partnerships foster a collaborative research environment in which ideas and knowledge are exchanged across all communities and help ensure the future competitiveness of the Nation's aviation industry. They also directly connect students with NASA researchers and our industrial partners and help to inspire students to choose a career in the aerospace industry. The FY 2012 budget request includes $1,024.2 million for Space Technology, a modest increase above the FY 2012 levels projected in the NASA Authorization Act of 2010, consistent with the priority the Administration is placing on research, technology and innovation efforts across the federal government. In FY 2012, Space Technology includes funding for longstanding Small Business Innovation Research and Small Business Technology Transfer programs (SBIR and STTR), technology transfer, crosscutting space technology programs formulated in FY 2011, and exploration technology programs that are being transferred into this account. NASA technology development activities under Space Technology will transform the Nation's capabilities for exploring space. Through this effort, NASA advances crosscutting and exploration-specific technology, performs technology transfer and technology commercialization activities, develops technology partnerships with other Government agencies, and coordinates the Agency's overall technology investment portfolio. The Office of the Chief Technologist (OCT) manages Space Technology. Space Technology is the central NASA contribution to the President's revitalized research, technology and innovation agenda for the Nation. NASA's Space Technology portfolio responds with investments that reach all corners of the Nation -- wherever there are innovative ideas and technical challenges to be solved. Advanced technologies are required to enable NASA's future science, aeronautics, and exploration missions. As demonstrated over many years, these same advanced technologies find their way into products and services available every day to the public. NASA's space technology is an innovation engine that invests in the high payoff, high-risk ideas and technologies of tomorrow that industry cannot tackle today. This unique work attracts bright minds into educational and career paths in STEM disciplines, enhancing the Nation's technological leadership position in the world and leaving a lasting imprint on the economic, national security, and geopolitical landscape. Through these technological investments, NASA and our Nation will remain at the cutting-edge. In FY 2010 and the first quarter of FY 2011, NASA focused on planning, formulating and implementing the Space Technology project elements. The Agency received 1,400 responses to six Space Technology Requests For Information (RFIs) released during FY 2010. These inputs were invaluable in finalizing future Space Technology solicitations and demonstrate a strong interest in, and need for, significant NASA investment in space research and technology. NASA released solicitations for the ongoing Flight Opportunities and SBIR/STTR programs. In December 2010 NASA released the inaugural Space Technology Graduate Fellowships call. Consistent with provisions of the NASA Authorization Act, the Agency plans to release three additional high-priority solicitations spanning Space Technology's strategic investment areas. NASA also recently developed a draft set of 14 space technology roadmaps, which define pathways to advance the Nation's capabilities in space and establish a mechanism for prioritization of NASA's technology investments. Consistent with the NASA Authorization Act of 2010, NASA's space technology roadmaps are being evaluated and improved through a community-engaged process managed by the NRC that will produce a range of pathways and recommended priorities that advance the Nation's space capabilities. NASA's Partnership Development and Strategic Integration activities develop key space technology partnerships and guide NASA's space technology investment decisions. OCT provides a primary entry point to industry and Government agencies for technology transfer and commercialization, interagency coordination and joint activities, intellectual property management, and partnership opportunities. The Office is also responsible for development of an Agency technology portfolio and strategically coordinates Agency technology investments through Center and Mission Directorate advisory committees and through the space technology roadmaps to ensure that Space Technology investments serve NASA's missions as well as the interests of other Government agencies and the Nation's aerospace industry. The Agency's space technology investments include the Small Business Innovation Research and the Small Business Technology Transfer programs (SBIR and STTR). Small businesses have generated 64 percent of net new jobs over the past 15 years. NASA invests at least 2.5 percent of its extramural research and development in the SBIR program. The STTR program makes awards to small businesses for contracts for cooperative research and development with non-profit research institutions, such as universities. For STTR, NASA's investment exceeds 0.3 percent of its extramural research and development. For FY 2012, higher maximum awards for SBIRs are allowed, with Phase I awards that can reach $150,000 and, for Phase 2, up to $1 million. Also in FY 2012, NASA is aligning the SBIR and STTR topics with space technology roadmaps and the National Aeronautics Research and Development Plan, while coordinating with Centers and maintaining a Mission Directorate steering council to continue to improve our rate of mission infusion. Crosscutting Space Technology Development (CSTD) activities invest in broadly applicable technologies though early-stage conceptual studies, ground-based and laboratory testing, relevant-environment flight demonstrations, and technology testbeds, including the ISS. The NASA Mission Directorates, other Government agencies, and industry are the ultimate customers for Crosscutting Space Technology Development products. Within this element, there are three investment areas: Early Stage Innovation, Game Changing Technology and Crosscutting Capability Demonstrations. Early Stage Innovation funds space technology research grants and fellowships to accelerate space technology development through innovative projects with high risk/high payoff. It also funds the NASA Innovative Advanced Concepts (NIAC) effort, which studies the viability and feasibility of space architecture, system, or mission concepts. It includes the Center Innovation Fund to stimulate and encourage creativity and innovation within the NASA Centers, and provides the prizes for the Centennial Challenges competitions that seek innovative solutions to technical problems in aerospace technology. Through ground-based and laboratory testing, Game Changing Technology proves the fundamental physical principles of those technologies that can provide transformative capabilities for scientific discovery, and human and robotic exploration. Specifically for small satellites, the Franklin subsystem technology development activity matures subsystem technology in laboratory environments. Crosscutting Capability Demonstrations proves the most promising technological solutions in the relevant environment of space. Technology Demonstration Missions prove larger-scale system technologies in the space environment, whereas the Edison small satellite missions demonstrate the utility of these innovative space platforms for NASA's future missions. Flight Opportunities utilizes the capabilities of the commercial reusable suborbital space transportation and parabolic flight services industries to test technologies. Seventy percent of the CSTD funds will be awarded competitively, with solicitations open to the broad aerospace community to ensure engagement with the best sources of new and innovative technology. Industry, academia and the NASA Centers will participate in the development of CSTD products. In FY 2012, CSTD will engage hundreds of graduate students and researchers though grants and fellowships, initiate dozens of ground and flight technology demonstrations, initiate tens of technology studies, and formulate its first demonstration missions. In FY 2012, a significant portion of the FY 2010 Exploration Technology Development Program, as well as new exploration technology activities in planning for FY 2011, will move from ESMD to Space Technology. For traceability, the transferred activities have been consolidated in a specific budgetary element within Space Technology: Exploration Technology Development (ETD). NASA plans to capitalize on technical synergies in the project elements from Crosscutting Space Technology Development and Exploration Technology Development by managing these programs in an integrated manner. Technologies within ETD enable NASA to conduct future human missions beyond LEO with new capabilities that have greater affordability. Technologies for future human exploration missions are matured through ground-based and laboratory testing, relevant environment flight demonstrations, and technology testbeds, including the ISS. Technologies matured through demonstration flights may then be designed into future NASA human exploration missions with acceptable levels of risk. Exploration is the ultimate customer for Exploration Technology Development products. In addition to ongoing-guided Exploration-specific technology development activities, in FY 2012, NASA will use 30 percent of the funds within this account to fund competitive awards, drawing proposals from industry, academia, and the NASA Centers for innovative Exploration-specific technologies and demonstration missions. The FY 2012 budget request for Exploration is $3,948.7 million. In FY 2012 and beyond, NASA's Exploration programs will continue to support the U.S. economy by enabling safe, reliable and cost effective U.S.-provided commercial access to LEO for crew and cargo as soon as possible. Included in this budget request is funding for three new, robust categories or "themes" that will expand the capabilities of future space explorers far beyond those we have today: Human Exploration Capabilities, Commercial Spaceflight, and Exploration Research and Development. These systems and capabilities include launch and crew vehicles for missions beyond LEO--the Moon, asteroids, and eventually Mars, affordable commercial crew access to the ISS, and technologies and countermeasures to keep astronauts healthy and productive during deep space missions, and to reduce the launch mass and cost of deep space missions. The FY 2012 budget request includes $2,810.2 million for Human Exploration Capability (HEC). HEC is the successor to the Constellation Systems theme; programs and projects under HEC will develop the launch vehicles and spacecraft that will provide the initial capability for crewed exploration missions beyond LEO. In particular, HEC's Space Launch System (SLS) Program will develop the heavy-lift vehicle that will launch the crew vehicle, other modules, and cargo for these missions. The Multi-Purpose Crew Vehicle (MPCV) Program will develop the vehicle that will carry the crew to orbit, provide emergency abort capability, sustain the crew while in space, and provide safe re-entry from deep-space return velocities. NASA is currently developing plans for implementing the SLS and MPCV programs, including efforts to transition the design and developmental activities of the Constellation Program. A major element of the transition involves shifting design and developmental efforts away from a closely coupled system (Ares I and Orion) to a more general launch vehicle (the SLS) and crew vehicle (the MPCV). Consistent with direction in the NASA Authorization Act of 2010, the Agency has developed a Reference Vehicle Design for the SLS that is derived from Ares and Space Shuttle hardware. The current concept vehicles would utilize a liquid oxygen/liquid hydrogen core with five RS-25 Space Shuttle Main Engine (SSME)-derived engines, five-segment solid rocket boosters, and a J- 2X-based Upper Stage for the SLS. This would allow for use of existing Shuttle and Ares hardware assets in the near term, with the opportunity for upgrades and/or competition downstream for eventual upgrades in designs needed for affordable production. For the MPCV, NASA has chosen the beyond-LEO design of the Orion Crew Exploration Vehicle as the Reference Vehicle Design for the MPCV. The Orion development effort has already benefited from significant investments and progress to date, and the Orion requirements closely match MPCV requirements as defined in the Authorization Act, which include utilizing the MPCV for beyond-LEO crew transportation and as backup for ISS crew transportation. NASA will evaluate the Reference Vehicle Designs this spring and incorporate results of industry studies that the Agency solicited earlier this fiscal year. In particular, one of the greatest challenges for NASA is to reduce the development and operating costs for human spaceflight missions to sustain a long-term U.S. human spaceflight program. We must plan and implement an exploration enterprise with costs that are credible, sustainable, and affordable for the long term under constrained budget environments. As such, our development efforts will be dependent on sufficiently stable funding over the long term, coupled with a successful effort on the part of NASA and the eventual industry team to reduce costs and to establish stable, tightly- managed requirements. NASA plans to approach affordability comprehensively in pursuit of exploration beyond LEO to increase the probability that key elements are developed and missions can occur within a realistic budget profile. For all development activities, we will emphasize innovative acquisition and program management approaches, including risk management, to reduce recurring and operations costs. In doing so, plans for bringing the MPCV and SLS vehicles online with lower costs will be as credible and realistic as possible, and significant efforts will be made to ensure cost risks will be well understood. Overall, NASA's designs and acquisition strategies for the MPCV and SLS Programs will not be solidified until all of the pertinent knowledge on cost and safety is obtained to ensure an affordable and executable solution. NASA expects to finalize acquisition strategies this summer, and will obtain independent, external assessments of cost and schedule for SLS and MPCV design options during the spring or summer timeframe. We will share this information with the Congress -- including Members of this Committee -- as soon as we are able to do so. The FY 2012 budget request includes $850.0 million for the Commercial Spaceflight theme in Exploration. This effort will provide incentives for commercial providers to develop and operate safe, reliable, and affordable commercial systems to transport crew and cargo to and from the ISS and LEO. This approach will provide assured access to the ISS, strengthen America's space industry, and provide a catalyst for future business ventures to capitalize on affordable access to space. A vibrant commercial space industry will add well-paying, high-tech jobs to the U.S. economy, and will reduce America's reliance on foreign systems. In 2010, NASA further expanded its successful Commercial Crew Development (CCDev) Program by initiating CCDev2 in October 2010. In doing so, we solicited proposals to further advance commercial crew transportation system concepts and mature the design and development of system elements, such as launch vehicles and spacecraft. Depending on available funding in FY 2011, we expect to select a series of CCDev2 proposals for award early this year. Once finalized, the resulting CCDev2 agreements should result in significant maturation of commercial crew transportation system capabilities, with consideration given to NASA's draft human certification requirements and standards or the industry equivalent to those requirements and standards. Beginning in FY 2012, NASA proposes to take the accomplishments and lessons learned from the successes of the first two rounds of CCDev and incorporate them into a new initiative called CCDev3. This initiative will facilitate the development of a U.S. commercial crew space transportation capability with the goal of achieving safe, reliable and cost effective access to and from LEO and the ISS. Once the commercial crew transportation capability is matured and available to customers, NASA plans to purchase transportation services to meet its ISS crew rotation and emergency return obligations. For CCDev3, NASA plans to award competitive, pre-negotiated, milestone-based agreements that support the development, testing, and demonstration of multiple commercial crew systems. The acquisition strategy for CCDev3 is still in development, but it will feature pay-for- performance milestones, a fixed Government investment, the use of negotiated service goals instead of detailed design requirements, and a requirement for private capital investment. In calendar year 2011 work on NASA's Commercial Orbital Transportation Services (COTS) Program will continue under the Commercial Spaceflight theme, using previous-year funding. Both of NASA's funded COTS partners continue to make progress in developing their cargo transportation systems, based in part on NASA's financial and technical assistance. In particular, on December 8, 2010, Space Exploration Technologies (SpaceX) successfully launched its Falcon 9 vehicle, and demonstrated separation of the Dragon spacecraft and completion of two full orbits, orbital maneuvering and control, reentry, parachute decent and spacecraft recovery after splashdown in the Pacific Ocean. For its part in COTS, NASA's second funded partner, Orbital Sciences Corporation (OSC), recently began integration and testing of its Cygnus Service Module and Taurus II launch vehicle. Both companies are expected to complete their remaining COTS demonstration flights in late 2011 or early 2012. In FY 2012, HRP and its associated projects will continue to develop technologies, countermeasures, diagnostics, and design tools to keep crews safe and productive on long- duration space missions. As astronauts journey beyond LEO, they will be exposed to microgravity, radiation, and isolation for long periods of time. Keeping crews healthy and productive during long missions will require new technologies and capabilities. Therefore, continued research is required to study how the space environment, close quarters, heavy workloads, and prolonged time away from home contribute to stress, and then develop technologies that can prevent or mitigate these effects. More specifically, in FY 2012, HRP will support approximately 15-20 biomedical flight experiments on the ISS and deliver the next- generation space biomedical ultrasound device to enhance the Station's human research facility capability. Other activities will include development of a training program for ultrasound diagnosis of fractures and the evaluation of blood analysis technology for astronaut health monitoring. Additionally, HRP projects will deliver an enhanced design tool for vehicle radiation shielding assessments and release the second version of an acute radiation risk model. In the area of behavioral health and performance, researchers will complete a sleep-wake actigraphy report on the ISS crew. In order to support its research requirements, HRP will release two NASA Research Announcements addressing space radiation health risks and human physiological changes associated with spaceflight. AES will continue projects from the Exploration Technology Development program that are close to application and closely tied to human safety in space. In FY 2012, AES will assume responsibility for developing and demonstrating innovative prototype systems to provide basic needs such as oxygen, water, food, and shelter that can operate dependably for at least a year. AES will demonstrate these systems in ground testbeds, Earth-based field and underwater tests, and ISS flight experiments. In FY 2012, AES will use a ground testbed to demonstrate the reliability of life support system components, and a portable life support system for an advanced space suit will be tested in a vacuum chamber. Ground-based analog field tests and underwater tests will validate a prototype Deep Space Habitat, where the crew will live during transit on long missions, and a Space Exploration Vehicle that will allow the crew to closely approach an asteroid, explore its surface, and conduct surface exploration outside the vehicle. AES plans to use innovative approaches for the rapid development of system concepts, such as small, focused teams of NASA engineers and technologists working with industry partners to gain hands-on experience. AES will pilot these processes to improve the affordability of future exploration programs. The FY 2012 budget request includes $4,346.9 million for Space Operations, funding the Space Shuttle Program retirement, the International Space Station Program, the Space and Flight Support Program. The FY 2012 budget request for the Space Shuttle Program is $664.9 million. In 2011, the Shuttle is slated to fly out its remaining missions. On March 9 Discovery completed mission STS-133, carrying supplies to ISS, as well as the permanent a Multi-purpose Module (PMM), a Multi-Purpose Logistics Module (MPLM) transformed to remain on orbit, expanding the Station's storage volume. In April 2011, Endeavour, STS-134, will carry the Alpha Magnetic Spectrometer (AMS) and attach it to the Station's truss structure. The final Shuttle mission, STS-135, is targeted for late June of this year, if funding is available. During the mission, Atlantis will deliver critical supplies to the ISS and recover and return to Earth an ammonia coolant pump module that failed on the Station last year. Following the completion of the remaining missions in 2011, the Space Shuttle Program will focus on transition, retirement, and disposition of program assets and workforce. Approximately 1.2 million line items of personal property (e.g., equipment) are associated with the Space Shuttle Program, with about 500,000 of these line items associated with the Space Shuttle propulsion system elements (the Reusable Solid Rocket Motor, the Solid Rocket Booster, the External Tank, and Space Shuttle Main Engines). As part of this effort, NASA will assess Space Shuttle property (including main propulsion system elements) applicability to the Space Launch System. On April 12, 2011, we will celebrate the 50th anniversary of human spaceflight, and the 30th anniversary of the first flight of Space Shuttle Columbia on STS-1. NASA recognizes the role the Space Shuttle vehicles and personnel have played in the history of space activity, and looks forward to transitioning key workforce, technology, facilities, and operational experience to a new generation of human spaceflight exploration activities. The FY 2012 budget request includes funding for Space Program Operations Contract (SPOC) Pension Liability. The United Space Alliance (USA) notified NASA of its desire to terminate all defined pension benefit plans as of December 31, 2010. USA has consistently incorporated and billed the maximum allowable costs into their indirect rates, but the recent deterioration of the equities and credit markets has caused their plan to be underfunded by an estimated $500-$600 million. The Space Program Operations Contract, which accounts for almost all of USA's business base, is a cost-type contract covered by the Cost Accounting Standards (CAS). These standards stipulate that any costs of terminating plans are a contractual obligation of the Government (if deemed allowable, allocable, and reasonable). NASA and USA entered into an agreement under which USA froze their pension plans as of December 31, 2010 and deferred any decision about terminating their plan until after December 31, 2011, allowing NASA to address this issue, if it arises, with FY 2012 funds, if appropriated. USA and NASA have instituted a working group to discuss pension termination options and have met with the Pension Benefit Guaranty Corporation to discuss potential options. If funding remains after the pension plan termination, it will be used to defray Space Shuttle closeout costs that would otherwise require FY 2013 funding. If there is a shortfall, it will reduce available Space Shuttle funds for closeout and some activity could move later than planned. We will keep Congress informed as this issue evolves. The FY 2012 budget request for the International Space Station (ISS) Program is $2,841.5 million, of which $1,656 million is for operations, research, and utilization, and $1,186 million for crew and cargo transportation. The ISS has transitioned from the construction era to that of operations and research, with a 6-person permanent crew, 3 major science labs, an operational lifetime through at least 2020, and a growing complement of cargo vehicles, including the European Automated Transfer Vehicle (ATV) and the Japanese H-II Transfer Vehicle (HTV), the second flights of which are taking place even as we speak. The FY 2012 budget request reflects the importance of this unparalleled research asset to America's human spaceflight program. In addition to conducting research in support of future human missions into deep space, astronauts aboard the ISS will carry out experiments anticipated to have terrestrial applications in areas such as biotechnology, bioengineering, medicine, and therapeutic treatment as part of the National Laboratory function of the Station. In support of this effort, NASA has recently released a Cooperative Agreement Notice (CAN) for a independent Non-Profit Organization to manage the multidisciplinary research carried out by NASA's National Laboratory partners. This organization will 1) act as a single entry point for non-NASA users to interface efficiently with the ISS; 2) assist researchers in developing experiments, meeting safety and integration rules, and acting as an ombudsman on behalf of researchers; 3) perform outreach to researchers and disseminate the results of ISS research activities; and 4) provide easily accessed communication materials with details about laboratory facilities, available research hardware, resource constraints, and more. The FY 2012 budget request for ISS reflects increased funding for the transportation required to support this research. The ISS transportation budget also supports NASA's continued use of the Russian Soyuz spacecraft for crew transportation and rescue services, pending the availability of a domestic crew transportation system, as well as U.S. commercial cargo transportation. The ISS transportation budget supports NASA's Cargo Resupply Services suppliers as they continue to make progress towards fielding their cargo resupply vehicles, which will be critical to the maintenance of ISS after the retirement of the Space Shuttle. We anticipate that the first commercial resupply flight will take place by the end of this year, and that both providers will have their systems operational in 2012. In FY 2012, the SCaN Program will continue to improve the robustness of the Deep Space Network (DSN) through its efforts to replace the aging 70m antenna capability with 34m antennae, launch Tracking and Data Relay Satellite (TDRS) K and continue the development of TDRS L. In the area of technology, we will conduct on-orbit tests using the Communication Navigation and Networking Reconfigurable Testbed (CoNNeCT), integrate the optical communications system on the Lunar Atmosphere and Dust Environment Explorer (LADEE) spacecraft, and begin operational space mission use of Disruption Tolerant Networking communications. The SCaN operational networks will continue to provide communications and tracking services to over 75 spacecraft and launch vehicles during FY 2012. The LSP has several planned NASA launches in FY 2012 including the NPOESS Preparatory Project (NPP), MSL, Nuclear Spectroscopic Telescope Array (NuSTAR), TDRS-K, and RBSP, and will continue to provide support for the development and certification of emerging launch services. The RPT Program will continue to provide test facility management, and provide maintenance, sustaining engineering, operations, and facility modernization projects necessary to keep the test-related facilities in the appropriate state of operational readiness. HSFO includes Crew Health and Safety (CHS) and Space Flight Crew Operations (SFCO). SFCO will continue to provide trained crew for ISS long-duration crew rotation missions. CHS will identify and deliver necessary core medical capabilities for astronauts. In addition, CHS will gather astronaut medical data critical for determining medical risk as a result of spaceflight and how best to mitigate that risk. NASA has enlisted the National Research Council to conduct an independent study of the activities funded within NASA's HSFO program, focusing on the role, size, and training requirements of the human spaceflight office after Space Shuttle retirement and Space Station assembly completion. The FY 2012 budget request also establishes a new line item called Mission Operations Sustainment, which will address future Space Operations functions essential to NASA's human spaceflight mission, including funding to purchase U.S. commercial crew transportation services to and from ISS once they are developed, and key ground and space infrastructure improvements required by the Space Network (SN) in order to accommodate anticipated demand in the outyears; the Mission Operations Sustainment budget would be utilized to fund this performance gap. Although the exact amount of funding required for these needs is unknown, it is clear that NASA's human spaceflight mission cannot be sustained without resources provided by Missions Operations Sustainment beyond FY12. The Agency will perform the requisite technical and program analysis and planning, and the results will be reflected in the FY 2013 budget request. The FY 2012 budget request for Education is $138.4 million. This budget request furthers NASA's commitment to inspiring the next generation of explorers in the science, technology, engineering, and mathematics, or STEM, disciplines. In FY 2012, NASA will continue to strongly support the Administration's STEM priorities and to capitalize on the excitement of NASA's mission to stimulate innovative solutions, approaches, and tools that inspire student and educator interest and proficiency in STEM disciplines. The Agency's education strategy will increase its impact on STEM education by further focusing K-12 efforts on middle-school pre- and in-service educator professional development. It includes an increased emphasis on providing experiential opportunities for students, internships, and scholarships for high school and undergraduate students. NASA higher education efforts will increasingly target community colleges, which generally serve a high proportion of minority students, preparing them for study at a four-year institution. NASA will use its unique missions, discoveries, and assets (e.g., people, facilities, education infrastructures) to inspire student achievement and educator teaching ability in STEM fields. In FY 2012, NASA will support the Administration's STEM education teaching and learning improvement efforts, including the America Creating Opportunities to Meaningfully Promote Excellence in Technology, Education, and Science (America COMPETES) Reauthorization Act of 2010, Race to the Top and Educate to Innovate, while continuing efforts to incorporate NASA missions and content into the STEM education initiatives of other Federal agencies. This may include providing competitions and challenges, supporting clearinghouses of Federal STEM education resources, providing high quality professional development, and other engagements. NASA will continue the Summer of Innovation (SoI) Pilot through partnerships with organizations that currently work with girls, minorities, and low-income students in grades 4-9 in summer and extended learning settings. The SoI project will deepen and broaden the efforts of communities and schools to successfully engage these students by providing high-quality, inquiry-based content, customized support, and access to NASA people, facilities and technology. NASA will continue to partner with universities, professional education associations, industry, and other Federal agencies to provide K-12 teachers and university faculty with experiences that capitalize on the excitement of NASA discoveries to spark student interest and involvement in STEM disciplines. Examples of experiences include research and hands-on engineering in our unique facilities and on a variety of real-world platforms that include high-altitude balloons, sounding rockets, aircraft, and satellites. NASA will also partner with science centers, museums, planetariums, and community-based education providers to allow informal educators to engage students in NASA's real-time, cutting-edge science and engineering discoveries and challenges. The FY 2012 budget request places increased emphasis on cyber-learning opportunities and the use of the ISS National Laboratory to engage students (at all levels) in launch activities, research and engineering grants, and courses based upon NASA science and engineering. In FY 2012, the Agency aims to increase the availability of opportunities to a diverse audience of educators and students, including women, minorities, and persons with disabilities. An example is the Innovations in Global Climate Change Education project that will be implemented within the Minority University Research and Education Program (MUREP). The project provides opportunities for students and teachers to conduct research using NASA data sets to inspire achievement and improve teaching and learning in the area of global climate change. The FY 2012 budget request includes $3,192.0 million for Cross Agency Support, which provides critical mission support activities that are necessary to ensure the efficient and effective operation and administration of the Agency. These important functions align and sustain institutional and program capabilities to support NASA missions by leveraging resources to meet mission needs, establishing Agency-wide capabilities, and providing institutional checks and balances. Within this budget request, NASA has taken steps to reduce its administrative expenses, including a partial hiring freeze and reduced travel. NASA's FY 2012 budget request includes $2,402.9 million for Center Management and Operations, which funds the critical ongoing management, operations, and maintenance of nine NASA Centers and major component facilities. NASA Centers provide high-quality support and the technical engineering and scientific talent for the execution of programs and projects. Center Management and Operations provides the basic support required to meet internal and external legal and administration requirements; effectively manage human capital, information technology, and facility assets; responsibly execute financial management and all NASA acquisitions; ensure independent engineering and scientific technical oversight of NASA's programs and projects in support of mission success and safety considerations; and, provide a safe, secure, and sustainable workplace that meets local, state, and Federal requirements. Cross Agency Support also funds salary and benefits for civil service employees at NASA Centers who are assigned to work on Center Management and Operations projects. In addition, the account contains Center-wide civil service personnel costs, such as institutionally-funded training. NASA's FY 2012 budget request includes $789.1 million for Agency Management and Operations, which funds the critical management and oversight of Agency missions, programs and functions, and performance of NASA-wide activities, including five programs: Agency Management, Safety and Mission Success, Agency Information Technology Services, Strategic Capabilities Assets Program, and Agency Management and Operations Civil Service Labor and Expenses. Agency Management supports executive-based, Agency-level functional and administrative management requirements, including, but not limited to: Health and Medical, Environmental, Logistics, General Counsel, Equal Opportunity and Diversity, Internal Controls, Procurement, Human Resources, and Security and Program Protection. Agency Management provides for the operational costs of Headquarters as an installation; institutional and management requirements for multiple Agency functions; assessment and evaluation of NASA program and mission performance; strategic planning; and, independent technical assessments of Agency programs. Safety and Mission Success activities are required to continue improving the workforce, and strengthening our acquisition processes, including maintaining robust checks and balances, in order to improve the safety and likelihood of mission success for NASA's Programs throughout their lifecycles. The engineering, safety and mission assurance, health and medical independent oversight, and technical authority components are essential to NASA's success. They were established or modified in direct response to several major Government accident and mission failure investigation findings in order to reduce the likelihood of loss of life and/or mission in our human and robotic Programs. The budget request also supports operation of three activities that each provides a unique focus in support of the independent oversight and technical authority implementation: the Software Independent Verification and Validation (IV&V) program; the NASA Engineering and Safety Center (NESC); and the NASA Safety Center located at the Glenn Research Center. Agency Information Technology Services (AITS) encompasses Agency-level cross-cutting services and initiatives in Information Technology (IT) innovation, business and management applications, and infrastructure necessary to enable the NASA Mission. AITS includes management of NASA's scientific and technical information; identity, credential and access management services; overarching information security services; enterprise-level business systems; and, other Agency operational services, such as e- mail, directory services, and enterprise licenses. NASA's Security Operations Center (SOC) will continue to mature capabilities to improve security incident prevention, detection, response, and management. NASA will continue implementation of major Agency-wide procurements to achieve: (1) consolidation of IT networks leading to improved network monitoring, management and reliability; (2) consolidation of desktop/laptop computer services and mobile devices to achieve improved security and enable NASA Centers and programs to realize improved efficiencies; (3) consolidation of Agency public web site/application management to improve the Agency security posture and to facilitate access to NASA data and information by the public; (4) minor enhancement and maintenance of integrated Agency business systems to provide more efficient and effective Agency operations; and, (5) reduction in overall Agency data centers and related infrastructure currently funded outside the AITS budget. The Strategic Capabilities Assets Program (SCAP) funds key Agency test capabilities and assets, such as an array of flight simulators, thermal vacuum chambers, and arc jets, to ensure mission success. SCAP ensures that assets and capabilities deemed vital to NASA's current and future success are sustained in order to serve Agency and national needs. All assets and capabilities identified for sustainment either have validated mission requirements or have been identified as potentially required for future missions, either internally to NASA or by other Federal entities. The Agency Management and Operations Civil Service Labor and Expenses funds salary and benefits for civil service employees at NASA Headquarters, as well as other Headquarters personnel costs, such as mandated training. It also contains labor funding for Agency-wide personnel costs, such as Agency training, and workforce located at multiple NASA Centers that provide the critical skills and capabilities required to execute mission support programs Agency-wide. The FY 2012 budget request includes $450.4 million for Construction and Environmental Compliance and Restoration. NASA Construction and Environmental Compliance and Restoration provides for the design and execution of all facilities construction projects, including discrete and minor revitalization projects, demolition of closed facilities, and environmental compliance and restoration. The FY 2012 budget request includes $397.9 million for the Construction of Facilities (CoF) Program, which funds capital repairs and improvements to ensure that facilities critical to achieving NASA's space and aeronautics programs are safe, secure, sustainable, and operate efficiently. The Agency continues to place emphasis on achieving a sustainable and energy-efficient infrastructure by replacing old, inefficient, deteriorated buildings and horizontal infrastructure with new, efficient, and high performance buildings and infrastructure that will meet NASA's mission needs while reducing the Agency's overall footprint and future operating costs. The CoF program prioritizes this budget based on risk of impact to NASA and Center missions, safety issues and accessibility. The FY 2012 budget request includes $52.5 million for the Environmental Compliance and Restoration (ECR) Program, which supports the ongoing clean up of sites where NASA operations have contributed to environmental problems. The ECR Program prioritizes these efforts to ensure that human health and the environment are protected. This program also supports strategic investments in sustainable environmental methods and practices aimed at reducing NASA's environmental footprint and lowering the risk of future cleanups.